It’s a strange looking monument, full of contradictions. The top has snake-like 'nagas' at every corner; a tower of sharp angled rooftops and golden trim. In short, the top half looks like the upper reaches of a peaceful Buddhist temple. The bottom half is the opposite, with military themes. It’s a stone, gray, communist sculpture, in the stern Soviet style. Two of the figures are soldiers, both carrying AK-47s. Close in front of them, a woman holds a baby. For the pair of stern looking soldiers, one is Vietnamese. He’s easy to pick out; a pigeon sits atop his Vietnamese Army pith helmet. The other soldier at his side has a pigeon sitting on his collar, while his hand holds the baby’s arm aloft. He’s obviously a Khmer soldier. Meanwhile the woman holds her Khmer scarf, which is wrapped around his rifle. 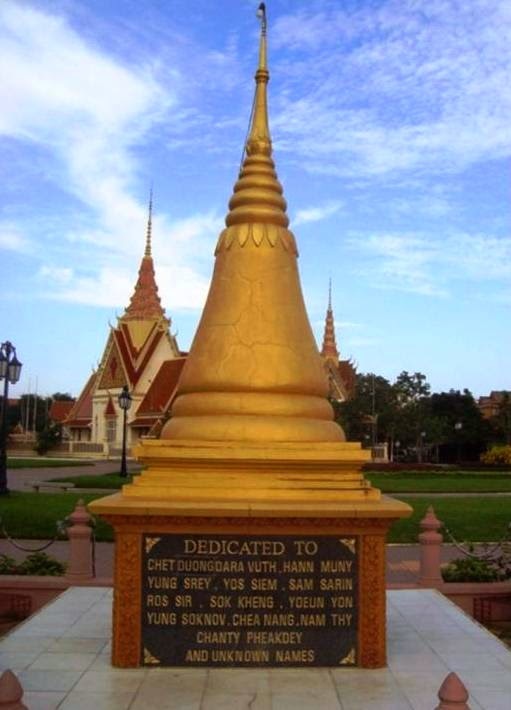 Between the two extremes a painted plaque shows this odd looking monument's theme: crossed Cambodian and Vietnamese flags. This is the '10,000 Year Cambodian-Vietnamese Friendship Monument' in downtown Phnom Penh. When the radical Khmer Rouge decided to take on Vietnam in the mid 1970's, they finally bit off more than they could chew. The USA and the west had given up on their military campaigns in Cambodia years before; so it was finally the Vietnamese that drove out the murderous Khmer Rouge. This was a rare time in history, when a communist country, 'liberated' another communist country. Many Cambodians today are grateful that the Vietnamese forced out the genocidal Khmer Rouge, that’s true. But it wasn't long after Vietnam took over Cambodia, that things turned sour. After Vietnam’s army forced the Khmer Rouge out of Phnom Penh, their soldiers began looting. The city’s empty houses were still full of furniture and appliances, left behind from the violent exodus of 1975. Mattresses were cut open with bayonets, as troops searched for hidden money and jewelry. Soon after, an enormous convoy of trucks loaded with looted booty was seen on Highway 1, heading back to Vietnam with their spoils of war. Their image as ‘liberators’ was tarnished. The Vietnamese have long been Cambodia’s traditional rival, and as the Khmer Rouge took to the countryside for another long guerrilla war, most citizens began to feel that the Vietnamese overstayed their welcome. Starting in 1978, Vietnam occupied Cambodia with over 180,000 troops, and they remained until 1989. More than 55,000 of them died. (A figure close to the number of US soldiers who had died in Vietnam.) Far more Khmers died during that same period. Every one of those years was full of unending conflict, and economic hardship. It didn't end there. There were further bomb plots in 2009, culminating in an arrest: “Banteay Meanchey provincial police chief Hun Hean said that his officers working with the Ministry of Interior caught 46-year-old Ty To at his home on Wednesday and found 53 different bomb-making items there, including TNT and radio devices,” according to the Cambodia Daily. "(Ty To) told the police that he was involved with the attempt to blow up the Cambodian-Vietnamese Friendship Monument and also with the TNT case on the Russian Boulevard (in Phnom Penh)," the paper said. What the local news reports don’t say, is a major reasons for those bombings, is connected to problems in the Mekong Delta. Centuries ago the entire delta was Cambodian territory. This is lost land that they still wish to have back. Many thousands of ethnic Khmers still live there today, and many of them followed a well known Buddhist monk. He was arrested by the Vietnamese, for what the Khmers say were trumped up charges. The bombing of the monument was an act of retaliation. This Khmer-Vietnamese rivalry still continues to this day. This is one of the larger public parks in Phnom Penh, and it has seen other violence. On the far side of the park, there is a wide stretch of red brick sidewalk; an open area with grass at the side. As I look, a few Khmers walk through. Nothing seems special about this sidewalk. Sadly, violence has visited this downtown park more than once. I walk down to a corner of the park, where post-war democracy took a big hit in Cambodia. Near the sidewalk, is a golden stupa (Buddhist memorial tower). The rope fence around it has been cut or frayed in places, but I can clearly read the plaque on the side. Back on that Easter day in this park, a peaceful protest was led by opposition leader Sam Rainsy. Just after he finished his speech, four grenades were thrown into his crowd of supporters. 16 innocent people died, and more than 100 were injured. Not surprisingly, nobody has ever been arrested or prosecuted for the massacre. That's because the protesters who died, were protesting against the government of the current Prime Minister (dictator) Hun Sen. Some US officials blamed Hun Sen's bodyguard unit for the attack. Soldiers that witnessed the carnage, were also seen aiding the escape of those responsible. Sadly, that hasn't been the end of political violence in Cambodia. Between 1999 and 2004, there were four politically motivated murders which also remain unsolved to this day. These have included a senior political adviser, a union leader, a judge, an actress, and a reporter. Most were well connected to opposition political parties. There are widespread suspicions and accusations that the CPP (Hun Sen’s party) was responsible for most of these murders. For all the advancements that Cambodia has made since the departure of the Khmer Rouge, democracy in this troubled country has a long, long way to go.